« What Prayer Can Be Offered? There is a saying that God is always working in our best interest to serve us and we just need to connect with this energy to deliver the goals or prayer we are seeking. Throughout my life, I’ve explored how this happens and have felt many times how this love flows from the Divine, and how much it comes closer to us when we reach out for more. Several years ago, I was at a turning point in my life. A mission I had served for many years had come to an end and I was looking for my next mission or project. During the time serving the Siri Singh Sahib, these missions would be given before you even asked! He would often instruct people to carry out projects and programs of service, often before you were finished with another so that we were always busy and focused on delivering the Dharma’s mission of service. At this time of closing of one chapter, I was waiting for my next assignment to be given. I waited and waited, but it didn’t come. Finally, I realized that this had to be requested. This was a new concept, as I was used to missions being instructed, and holding myself “thoughtless” without desire. So I started to ask, but the instruction still didn’t come. 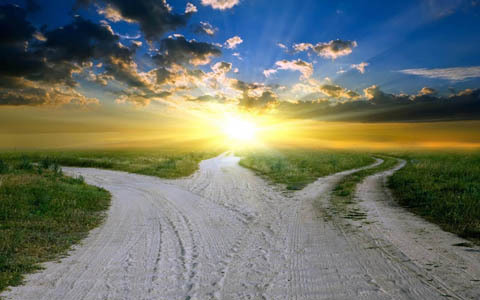 Again another realization arrived: I needed to ask to be guided with love. Instead of simply being neutral and serving whatever was in front of me, the next chapter would begin with a prayer that came from a deep desire to be of service to the Guru in my heart. Only with this love and longing would I be able to bring forth my request and ask for the blessing of a destiny of service to the Guru. This was a lovely revelation as it was a longing to deepen my relationship of service with the Guru. This process took several years, during which time I had to I let go of all my old desires, longings, and lingering expectations. Over this time I realized that, in order to reach this state of love of service, all other desires from which I wanted to operate besides service to the Guru were being cleared. So I let that love of the Guru and the desire of service broaden and develop. I kept growing this prayer until it was very deep and focused, without expectation of any outcome or desire besides this level of service. When the message came, it was beautiful. I was to teach others how to have a relationship with the Guru. Amazed, I asked, “Me? Really?” I heard back, “Yes. You.” Then I was given seven steps to accomplish this through the Shabad: Jaap (recitation); Bhajan (spiritual song); Sunniai (listening); Dhyan (meditation); Simran (vibrational remembrance); Veechar (contemplation); and Gyan (divine wisdom). 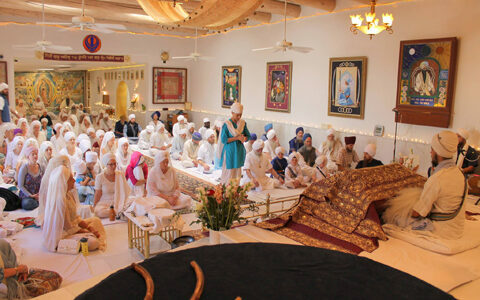 I wrote it all down and began to develop a series of online Shabad Guru courses. Even though I had no experience teaching and had a stutter when I spoke, those issues weren’t of concern to the Guru. In each moment from then on, this mission of service would flow through me and I felt it was the Guru’s desire for me to go forward. Having lost all of my other desires, there was only one choice: proceed in trust with the Guru. I realized that all I had to do was show up, without attachment to any outcome, and hold the prayer for the Guru to deliver the results. It seems amazing to me now to feel and see that the energy of delivering myself in service is what allows the Guru to come through me and bless each person who comes forth to participate in this teaching. So many people have said that they have had the most divine experiences as a result of taking this course, and I really feel it is the Guru delivering the energy making it happen. I’m blessed to be of service in this way. It wasn’t easy in the beginning. 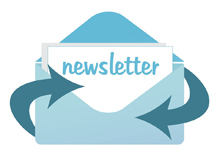 When I was starting out I would talk to others who have taught about the Shabad Guru. One of these was SS Prabhu Nam Kaur, a Shabad Guru teacher near San Francisco, CA. During my visit, a Gurdwara was held at the ashram. Sitting behind the Guru I could feel the weight of this mission and thought, “Wow, how is this going to happen? It seems like so much work!” At the very moment that I had this thought, Prabhu Nam Kaur began to sing the shabad: Santaa Kae Kaaraj Aap Khaloeiaa Har Kanm Karaavan Aaeiaa Raam (“God Himself/Herself has come to do the work of the Saints; God has come to complete their tasks”). At that moment, hearing this shabad, I realized that by calling out to God and Guru, the energy of this Divinity opened up to power the mission of service to manifest. This brought so much love into my heart to know that I have a Guru who offers this much support and gives an abundance of love to those who reach out even a little. the Guru takes millions of steps to receive them. For their sake, the True Guru remembers them again and again. the True Guru blesses them with all the treasures of wealth. The True Guru is a repository of compassion that is beyond description and understanding. It is incredible to experience the gifts that come along with service, seeing how the Guru delivers every project! In Gurbani, the words for Fear and Love are very similar: ਭਉ “Bhao” (Fear) and ਭਾਉ “Bhaao” (Love). Reciting these words gives an experience of their meaning through kinesthetic movement. When we create the sound Bhao, it is short and contained/contracted. With Bhaao, the sound is the opposite: open and expansive; our throat is clear and wide. These sounds demonstrate how the experiences of love and fear play out in the body and how the two are conjoined: we must know contraction to feel expansion. We must know how to be an individual in order to be universal. With the Fear of God as the bellows, fan the flames of tapa, the body’s inner heat. In the crucible of love, melt the Nectar of the Name. The contraction of Bhao, fear, creates the flame for movement towards the expansion of Love (Bhaao) where we melt in the Nectar of the Naam. This symbolism brings to mind the idea of a slingshot—when we find ourselves drawn further into one side, it creates the pressure and impetus to fly further in the opposite direction. In other words, our experience of fear and contraction brings more motivation to expand into Love. 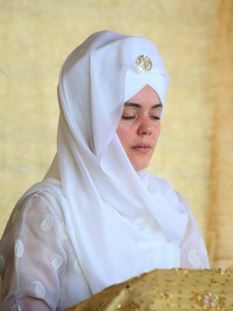 SS GuruKirin Kaur Khalsa is a Sikh Dharma Minister and Shabad Guru teacher. Having been born into the Sikh Dharma community, she started practicing Kundalini Yoga and Sikh Dharma from an early age and went to school in India for 10 years. This is where her deep love of the Shabad Guru developed. After her schooling, GuruKirin Kaur worked under the Siri Singh Sahib (Yogi Bhajan), serving the Dharma through our legacy non-profits. 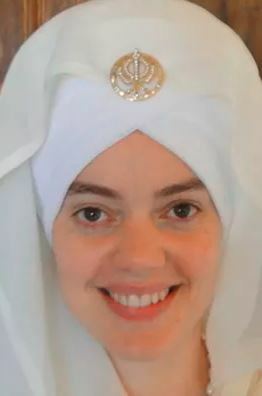 Her deep love for Sikh Dharma, the Guru’s mission, and Gurbani inspires her to teach others about the Shabad and build their connection to the Guru. She also loves to talk about prosperity, connecting Gurbani to the infinite resource of God’s creation.